Two years ago, I met four-time, best selling author Colin Sprake at a conference he was speaking at in Vancouver. Colin is an internationally renowned entrepreneur, business coach, mentor and dedicated teacher to over 47,000 entrepreneurs. He is also the master trainer at Make Your Mark (MYM) Training and Consulting, devoted to helping people achieve huge success in their businesses. On the day I met Colin, I was so impressed by his presentation that I immediately signed up for his 3-day course. After his presentation, I went up to tell him how impressed I was and he asked me what I did, so I shared with him that I am a master Feng Shui expert and also advisor (of a different sort) to many entrepreneurs. What resonated most deeply with him, is that everything is energy including time and space and how working with Feng Shui gave people the advantage of their space and time working for them instead of against them. I explained to Colin how Feng Shui is not merely moving furniture around to make things better. I emphasized the most important question: does your chosen site have the energy to support you? To understand this better, I use the analogy of a garden. For a seed to have a good yield, you must have good rich soil, sun, and protection from wind. The energy from the environment helps the seed produces a good yield. Feng Shui is similar. The energy isn’t always literal, it is also magnetic, but it still affects people profoundly. And it resonated with Colin especially at this point in his life. At the time, Colin was in the midst of moving into a new space–the perfect transition period. We met up after the conference to discuss the best steps to take in preparation for moving into a new space, and we’ve been working together ever since. Over the past two years, we’ve worked together to maximize the energy of the MYM office and team, and strategies for implementing Feng Shui into MYM. I’ve helped shift Colin’s stereotypical perspective on Feng Shui and assisted him with making big decisions, around hiring, and where the business is going. We sit down at the end of every year to reflect and go over the details of what’s to come for the company in the next year. I’ve enjoyed working with Colin; his company epitomizes great values. He knows it’s no longer just about where the furniture is placed, but about the location’s energy as a whole, because 30% of our success is determined by our location. 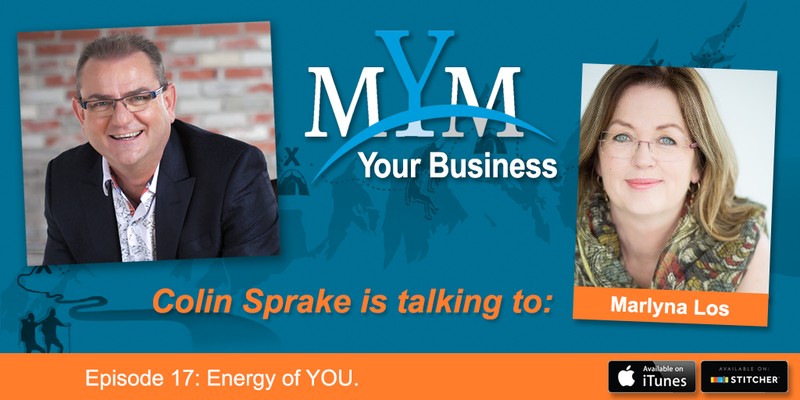 Recently, I had the honour of being featured in episode Episode 17 of Colin Sprake’s podcast: “Energy of YOU, with Marlyna Los”. This podcast series walks listeners through the process of building a team, attracting the right people to it, and creating loyalty among your team members. What Feng Shui is and why it really matters for business owners. How the way you have your office laid out dramatically affects the success of your business. Different types of energies that can be at odds with each other, and how to manipulate them correctly. Why people typically choose what’s familiar (even if that choice negatively impacts them). How artwork impacts the subconscious. Understanding the superpowers and weaknesses that you’re born with. Why it takes time to get used to spaces that match your goals. The science behind Feng Shui. Why good business systems are just as important as good Feng Shui. I hope you enjoy listening to this podcast! Please do get in touch by calling me at (604) 339-8878, or sending me an email at [email protected], with any additional questions about the importance of Feng Shui for running a successful and harmonious business. I’d love to chat!